This homemade pizza is simple yet so delicious. 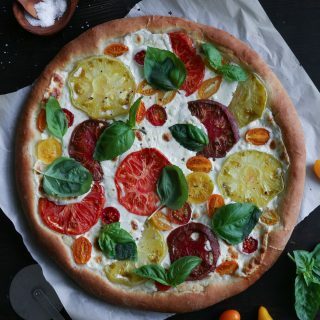 Uses heirloom tomato slices in lieu of sauce, along with fresh mozzarella and basil. A gluten-free and spelt crust is also included in the recipe! For the crust, I use Rapid Rise yeast to cut the rising time down. If you are using regular active dry yeast, you'll have to let it rise a bit longer. Place 1 cup of flour, rapid rise yeast, oil, honey, and salt into a large mixing bowl. Slowly add your warm water and begin mixing with an electric mixer or wooden spoon. Beat until the mixture is smooth, about 2-3 minutes. Begin adding additional flour ½ cup at a time until it forms a soft dough. Place dough onto a lightly floured surface and knead for 5-7 minutes or until dough is soft and smooth. Be careful not to add too much flour or the crust will be hard (If using spelt flour you may need more flour as it's not as absorbent as all-purpose.) Place dough into a lightly oiled bowl and turn to coat. Cover the bowl with plastic wrap or a damp kitchen towel and let rest in a warm place for 15 minutes. If using active dry yeast, let rise about 40-60 minutes. *Tip: If your kitchen is cool, you can turn on your oven to the lowest setting for 1-2 minutes and then turn off. Oven should be warm but not too hot to touch. Place bowl inside of the warm oven to rise. Alternatively, you can place a pan of boiling water in the bottom of your oven (turned off) and close the oven door. The steam and moisture will also be a good environment for the dough to rise. Preheat oven to 450ºF. Thinly slice tomatoes and place onto a clean kitchen towel or paper towels. Pat dry to remove excess moisture, otherwise the pizza can become watery while baking. Place dough onto a large piece of parchment paper or lightly greased pizza pan/baking sheet and gently stretch it out to about 12-14 inches, but be careful not to overwork the dough. The size will determine how thick or thin the crust is—smaller pizza for thicker crust, spread it out larger for thinner crust. If you get a hole in the crust when stretching it out, just pinch the dough back together. Top with alternating slices of tomatoes and mozzarella. I didn't use sauce, but if you want to add some, I have an easy pizza sauce recipe here. Sprinkle the top with salt, freshly cracked pepper, and a drizzle of olive oil (optional). Top with fresh basil and serve. Cuts into about 8-10 slices.